I’ve always been envious of the tasty chole (chickpeas) that my Punjabi friends seem to make so effortlessly. When I ask for the recipe, often the whole operation seems hopelessly complicated. One friend slow cooks the raw chickpeas for over 2 hours. Another places a tea bag in her chole while cooking. An online recipe suggests that I should put cloves and a piece of cinnamon when soaking the raw chickpeas. No one seems to go into sufficient detail. Soak? For how long? In how much water? What next? Do the soaked chickpeas need to be cooked in the pressure cooker? Again, for how long and in how much water? These questions continue to circle in my head. In the past I’ve used canned chickpeas. But my husband turns up his nose at any canned chole recipe. “Fresh chana tastes so much better than that soapy stuff. And canned chole never acquire the buttery softness that makes them melt in your mouth,” he says. I have no idea how to make chickpeas from scratch in my kitchen, and I’m longing for some. The simple, home-made kind that no restaurant serves. Steaming hot and eaten with rice. Or ladled on top of pea-potato patties with a squeeze of lemon and sprinkle of chopped onions and green coriander leaves. My experiments have failed miserably so far. I soak the chickpeas in water for too long on one occasion and then it melts into a glutinous mess in the pressure cooker. Another time I undercook the chickpeas in the cooker, and they turn out pebbly and nowhere close to buttery soft. On yet another occasion, the pressure cooker runs short of water and the chickpeas get stuck to the bottom of the cooker. Finally, I make it stubbornly each week in the hope that it’s going to turn out perfectly. After weeks of experimentation, and no response from my nani who makes delectable chana in a dark tamarind sauce, my mother-in-law gives me a tangy red chole recipe. Her recipe is sweet and sour from a generous quantity of tomatoes and has plenty of onion and minced ginger-garlic for a delicious earthy aroma. Cilantro, a staple herb in Andhra cooking, is a must, she says. Upon her recommendation, I use a simple home-made garam masala which requires no toasting and is ready with a quick turn in the spice/coffee grinder. Green cardamom in the masala lends an unusual fragrance to the chickpeas while black peppercorns add a spicy bite. Mummy’s chickpea dish is piquant from tomatoes; other versions use imli, which is tamarind, or amchur, which is dried mango powder, or a combination of one or two or all three. (1) Soak the chickpeas in the plenty of water overnight for 8-12 hours, but not more than that. Drain the water and place the soaked chickpeas in the pressure cooker. (2) Add enough water in the cooker to submerge the chickpeas and form about a half inch above the chole. The pressure cooker should be no more than half full of water and pulses. Later, reserve the excess water and cook the chole in the water that the chickpeas have been pressure-cooked in. If there is too much water, some of the water can be removed and kept aside. (3) Bring the pressure cooker to 2 whistles on medium heat, then continue to cook for about 30 minutes on very low heat. Allow all the steam to escape before opening the pressure cooker. (4) You can use store-bought chole masala or make your own. 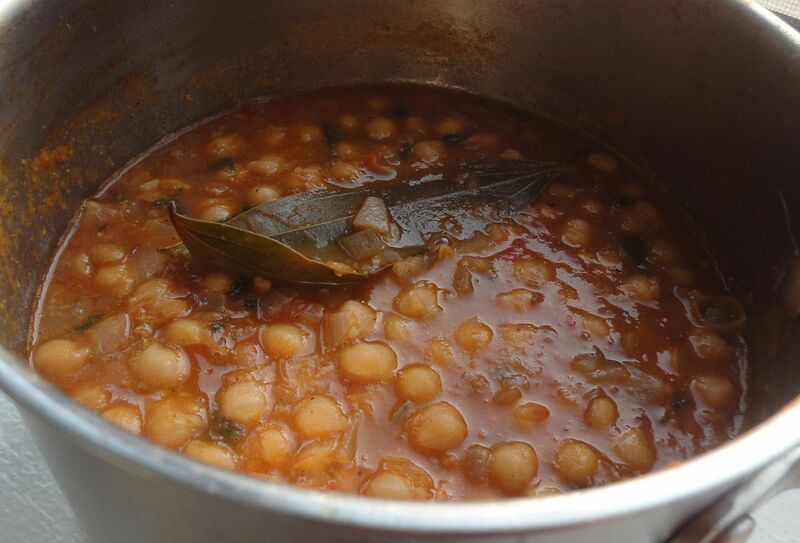 See my mother-in-law’s recipe for home-made chole masala below. 1. Heat the oil and add the tarka of bay leaves and cumin seeds. Wait for the cumin seeds to sputter. Next, add the onions and cook them with a sprinkle of sugar until they brown. 2. When the onions are almost done, add the finely minced ginger and garlic, stirring to make sure that they don’t burn. Wait for a few seconds until the unmistakable aroma of garlic releases from the pan. 3. Add the tomatoes along with a cup of water, and let the mixture cook until the oil releases from the edges of the tomato and you can see the oil glistening on top of the paste. 4. Add the chickpeas and enough of the reserved water to cover a half inch over the top of the chickpeas. Add the salt, 2 tsps of the chole garam masala, and the cayenne pepper powder if using. Bring to boil and allow to simmer on low heat for 15 minutes. This is an important step because it allows all the flavors to come together. Add chopped cilantro towards the end. Serve hot with rice or Indian bread. this sounds delicious! I’ve never really ventured into cuisines other than Asian, so it’ll be fun to try out some of your great ideas! tried this recipe the other day and it was yummy! the cardamom-pepper combination adds some lovely notes to the flavor of the chole. Thanks Vrushali! So glad that it turned out well.